You probably don’t really know how to do something that you’ve been asked to do for a good portion of your life. What is it? Taking notes. One of the most overlooked skills there is! According to academic research, we aren’t taught note-taking skills as students, even though we’re expected to do it. Don’t get your hopes up that iPads and laptops have made things better in regards to notes and attention. They haven’t. Laptops are horrible during presentations and lectures. Here’s one for Captain Obvious: Most people aren’t taking notes on a laptop during a presentation; they’re trying to improve their Reddit karma. Why Should You Take Notes in a Meeting? Before diving into various effective note-taking strategies to improve your memory, recall and to-do lists, let’s think about why we should take notes at all. The benefits aren’t just for you taking it all in, sitting in the chair. It’s also for the presenter. If you’re around a conference table, nothing makes a presenter more nervous than that one person just sitting back, relaxing and trying to catch M&Ms in his mouth. Taking notes or being prepared to take notes shows the presenter and the rest of your team that you mean business, and that the concepts being presented are important. When people jot something down, it displays that the listener is engaged and that the ideas discussed are relevant to participants. If you aren’t taking notes in a meeting or don’t feel the need to, it could be a sign that this meeting isn’t for you and that your time could be better spent elsewhere. You could join in with the M&M guy and dive into the intricacies of the snack bowl. Or you could be intellectually engaged. You have to hear and observe what’s being said, and then jot down a few points. That seems like a rote activity, but it helps your comprehension. No person can record notes as fast as they’re delivered, so you’re immediately processing what’s being said. ClickUp makes it easy to take notes during meetings. Try the Notepad by ClickUp Chrome extension! You can also use Clickup to help manage your meetings. See this post for more on planning your meetings. As an adult, it could be difficult to change up the way you’ve always taken notes, but in general, you should consider these three points. Use keywords or short sentences. You’re not able to write down everything the lecturer or presenter says, so focus on keywords. Unless you’re a journalist (who usually have their own methods of note taking) you don’t have to capture a quote word-for-word. And if you do, you probably should record the presentation and then listen back later. Use your own words. As mentioned above, you won’t be able to quote anyone word for word. Nor should you have to. During a meeting, you’ll want to only capture the information that’s pertinent to you and then crystallize that into what’s useful for you, too. In the process of taking notes, rewrite it in a way that’s comfortable and meaningful for you to comprehend later. Only write down what matters. That seems fairly obvious on the surface, but trying to write down every key point without thinking of its importance causes two problems. 1) you waste time writing 2) you create more work for yourself when trying to go over notes again later. Make it a goal to not write down every point, because then you’re diluting the ones that matter most. Tired of the basic outlines of notes with line after line filled? Good, because here are some methods that will speed up the process for you. ?Put a question mark before or after a note if you have more questions? 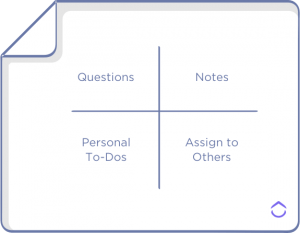 As the meeting progresses, you put relevant notes, ideas and information into each of these quadrants instead of parsing through notes later for the relevant assignments and takeaways. Why It Works: Separates your next tasks as you process. It saves an extra step when going back through your notes. 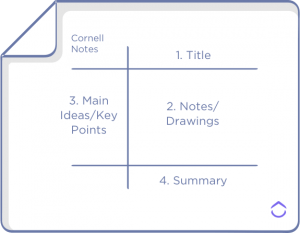 This was popularized at the Ivy League school, and it’s one of the most worthwhile note-taking methods to help you stay organized. Take your sheet of paper and draw an “I” on it. It’s okay if your paper is blank or has lines. The “I” should be slightly off-center so there’s more space on the right compared to the left side, though the left side should be larger than the typical notepaper margin. Title. Ok, so first at the top, put your title. Include the name of the meeting/lecture, the date and possibly any participants that have attended. Notes. Next, you’ll want to take notes or draw sketches in the large right hand side space. This is where you’ll capture the noteworthy ideas and information during the meeting. Main Points. After the meeting is over, look over everything you wrote in the main right section. Write down the most important ideas or the key concepts in the left-hand column. These are the main points that you’ll need to remember. Why It Works: It’s formatted, but close enough to a traditional outline to make sense to anyone who didn’t attend the meeting or presentation. I would definitely be willing to hand this off to someone who didn’t attend. This is for those that really want to elevate their note-taking game. It’s a whole company based on teaching businesspeople how to engage better with presentations and written materials. It’s called Smart Wisdom. Here’s the idea: you create chains of meaningful words, capturing the main thoughts and questions while branching out loose fragments from that main idea. If you ever had to diagram sentences in school, it kind of looks like that except on the fly. Does it work? According to studies in peer-reviewed journals, Smart Wisdom increased the ability to recall by 24% and comprehension by 23% over those who didn’t use the system. Huh. The benefit is that you actually spend less time taking notes, but are able to retain more. Seems like a heavy investment, but if you’re in lots of meetings, briefings or presentations than it could be worth it. Why It Works: It reduces how much you need to write down. 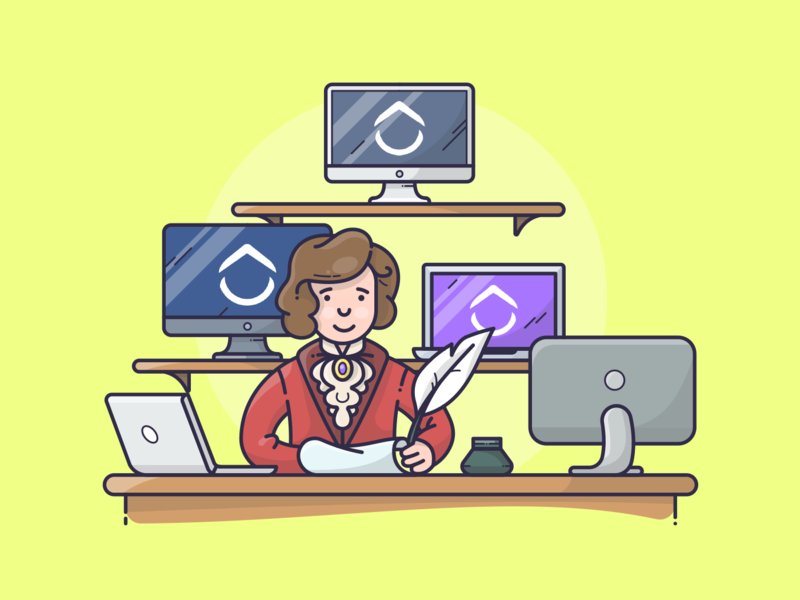 They provide you with the shortcuts, structure and thought processes to cut down on any extraneous writing. What next? You’ve got to do something with that info. If you’ve attended a presentation or lecture, and there are no immediate work-related next steps, you may want to save your notes in a file-sharing program like Evernote, Dropbox, Google Drive or another collaboration tool. Then the rest of your team can see it. If you need to create your own to-do lists, assign tasks to a team member or start a project, then save your notes in a project management system like ClickUp. ClickUp lets you put your notes into action. The Notepad is perfect for transferring your handwritten notes over to your project management tool. In the Notepad, you can format your notes with bold italic or code blocks, save them to reference later and remind you of tasks to set up. Install the Chrome extension, and use it whenever you browse the web. What Can You Do With The Notepad in ClickUp? The more you use Notepad, the more its uses will expand. The convenience factor will open more opportunities for you to use it, extending your mind and transforming the way you interact with your work. What’s The Best Note-Taking Strategy? You won’t want to hear this answer, but the best way to take good notes is to use the system that works for you. You should experiment and try new methods, but ultimately notes are about recording the info you need right away and then putting that valuable info into action. However, you do it should be in a system that makes the most sense for how you like to get things done. Check out our list of best note taking apps.